The talks resumed today but officials from several delegations said no deal had been sealed for the bloc’s next long-term budget. THE EU BUDGET summit has ended without a deal, latest reports say. AFP is reporting that the EU budget summit ended without a deal, saying that the European Union summit wound up today with no deal sealed for the bloc’s next long-term budget, according to officials from several EU delegations said. “There is no agreement,” one official said. The European Council released a statement today saying it gives its President the mandate together with the President of the European Commission “to continue the work and pursue consultations in the coming weeks to find a consensus among the 27 over the Union’s Multiannual Financial Framework for the period 2014-2020″. The bilateral talks and the constructive discussion within the European Council show a sufficient degree of potential convergence to make an agreement possible in the beginning of next year. We should be able to bridge existing divergences of views. A European budget is important for the cohesion of the Union and for jobs and growth in all our countries. With the 27 heads of state and government bitterly divided over spending policy, there had been little hope of a deal on a trillioneuro budget for 2014-20 during the two-day summit. British Prime Minister David Cameron headed a group of austerity-driven nations demanding huge cuts in the next seven-year budget to match belt-tightening measures at home. Divisions between have and have-not nations on how to spend the EU’s billions caused further disagreements. EU leaders had looked set to throw in the towel today as talks on a trillion-euro budget for the 27-member bloc faltered over tensions between rich and poor states and Britain’s “virulent” demands for austerity. The talks centre on the bloc’s budget for the next seven years, and failed to reach any accord last night, amid disagreements over the level of spending until 2020. 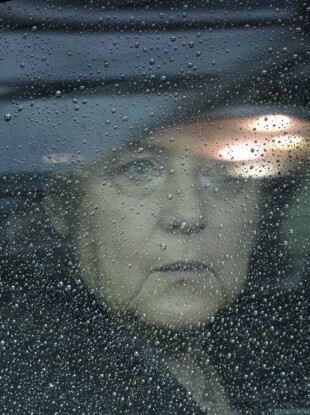 German chancellor Angela Merkel had said last night that she had doubts as to whether a deal could be reached at all. European Council Herman President van Rompuy distributed his proposal for a budget (officially known as the 2014-2020 Multi-Annual Financial Framework (MFF)) yesterday. He then spent much of the day locked in talks with individual leaders on the issue. According to the BBC, news conferences are expected to be held later today. Email “EU budget summit 'ends without deal'”. Feedback on “EU budget summit 'ends without deal'”.